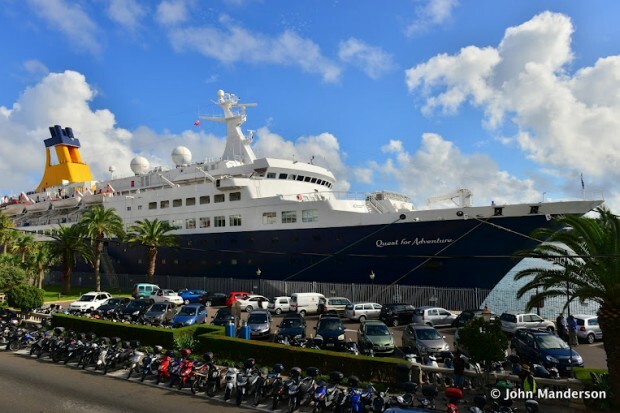 The MV Quest for Adventure arrived in Hamilton at 8am yesterday [Oct 8] and will depart today at 5pm, with its approximately 500 passengers and 220 crew. 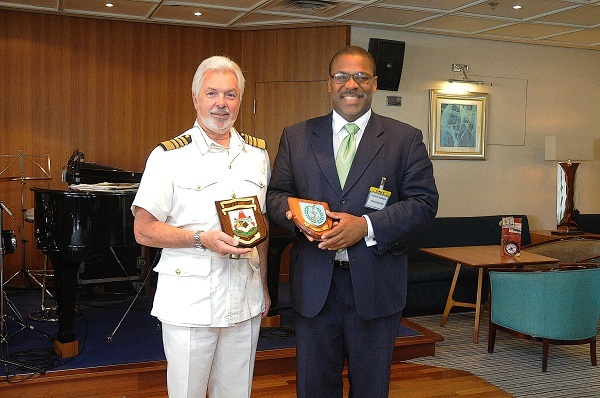 Pictured below are Minister of Transport Walter Roban and Captain David Warden-Owen, Master on the MV Quest. Quest for Adventure, thanks for gracing our Harbor where very few ships can dock (and we know the reasons why). Maybe the Government and the COH can persuade the Quest for Adventure to call into Hamilton more often. What is Walter Roban doing in this role, this should be Wayne Furbert? Well actually should be someone entirely different who knows something about the cruise ship industry and its needs. These guys are all under educated! sing – a – poor!! Nope, they’ll just drive around in their new GP cars all day with the a/c on and demand ideas and solutions from the OBA. What we should do is form a Cruise Ship Committee/Group who know about the Industry and meet with the cruise lines to try and attract them to Bermuda. During the David Allen days, his team had no interest in cruise lines like Carnival and now we can’t even get Carnival to visit Bermuda. See what happens… becareful what you wish for because karma is you know what if you look at it our situation… its karma! Read/listen carefully to what the PLP or should I say Ebrown says via the likes of the Tourism Ministers an dothers. There are no cruise ships out there small enough for Hamilton/St. George’s and VOILA!! Here is one… Mr. Mayor, claim that Cruise ship for St. George’s for the Cruise Season next year and for as long as they are willing to grace your harbor. Yes it is true that most of the smaller vessels out now do world cruises but it is so funny that most of them do not even call/visit Bermuda. As they there there is ALWAYS a way and I am sure there is a vessel out there capable of calling into Bermuda. I remember about a year ago there was some mention that MSC Cruises was interested in sailing to Bermuda with a vessel that could port in the City of Hamilton – what ever happened with that?